Bavaria Sausage, Inc. has been recognized for over 53 years for unmatched quality and consistency. Wherever gourmet or connoisseurs of fine food gather to discuss excellence, the Bavaria name is proclaimed as the ultimate in fine sausages. And among members of the meat industry, the Bavaria brand is recognized and appreciated to represent the Old World "Wurstmacher" (Sausage Maker). We have been selling our products to fine specialty stores, restaurants, country clubs, resorts, brew pubs, and many annual fundraiser events all over the USA for over 53 years. You won't find us in any super market or grocery store chain, because we do NOT consider ourselves to be a warehouse of stock-piled products..We make our items fresh for order- "From our kitchen to Yours"
We pride ourselves in providing a fresh, quality product no matter how big or small the order may be! Our consistent and persistent belief is to provide a higher quality product by utilizing traditional old world sausage making recipes using only the finest spices and seasonings... and it is crucial to our commitment of quality to turn out our product in smaller batch sizes thus providing a much easier working rotation of consistently fresher product! We do not believe in "cutting corners" to provide faster nor bigger sales returns... We are a family owned & operated business and strive to keep the consistency and quality of our products our number one concern! 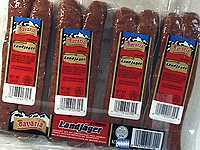 Page Summary: Bavaria Sausage, Inc. has been recognized for over 45 years for unmatched quality and consistency. We are an old world sausage maker that prides ourselves in providing a fresh, quality meat product no matter how big or small the order may be!